After tightening policy twice last year, the Monetary Authority of Singapore -- which uses the exchange rate as its main policy tool -- left the slope and width of the currency band unchanged, as well as the level at which it is centered. The stance is “consistent with a modest and gradual appreciation path” of the currency band, it said in a statement on its website. The Singapore dollar weakened after the decision, dropping as much as 0.1 percent to S$1.3580 against the U.S. currency. It was unchanged at S$1.3562 as of 9:56 a.m. on Friday. “The growth and inflation rhetoric has come off quite a fair bit,” said Selena Ling, an economist at Oversea-Chinese Banking Corp. in Singapore. After last year’s tightening “they’re in pause mode” now, she said. Central banks globally have taken an abrupt turn toward more dovish policy in 2019, led by a change in tone from the U.S. Federal Reserve. World growth forecasts have been repeatedly downgraded, including by the International Monetary Fund this week, as U.S.-China trade tensions remain heightened and as Chinese demand ebbs. The government is projecting growth in the export-reliant economy will slow to just below the midpoint of the 1.5 to 3.5 percent range after a 3.2 percent pace in 2018. A separate report Friday showed gross domestic product grew 1.3 percent in the first quarter from a year ago, lower than economists had projected. The central bank lowered its core inflation forecast range for this year to 1 percent to 2 percent from 1.5 percent to 2.5 percent previously, mainly because of a drop in electricity costs. In February, the central bank lowered its headline inflation projection to 0.5 percent to 1.5 percent. The Monetary Authority of Singapore paused its tightening cycle Friday, acknowledging weaker-than-expected global growth and the significant uncertainty that hangs over the short-term outlook. Assuming the central bank’s latest forecasts hold up against the remaining downside risks, we think the MAS will also keep its policy settings unchanged at its next meeting in October. The MAS guides the local dollar against a basket of its counterparts and adjusts the pace of its appreciation or depreciation by changing the slope, width and center of a currency band. It doesn’t disclose details of the basket, or the band or the pace of appreciation or depreciation. 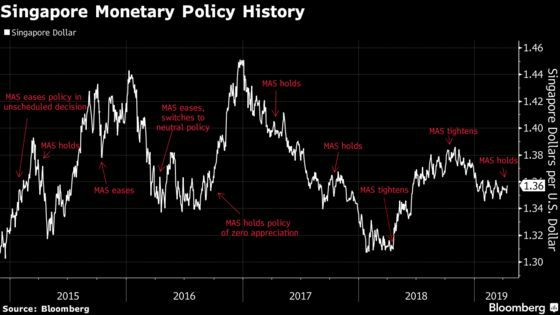 The MAS’s dovish tone suggests it may extend its pause to October’s policy decision, according to Mitul Kotecha, an emerging-markets strategist at TD Securities in Singapore.